The answer, which I should have guessed given the season: They’re not African-American. They’re gingerbread. I should have known. I must remember, however that this lesson does not apply to real life. 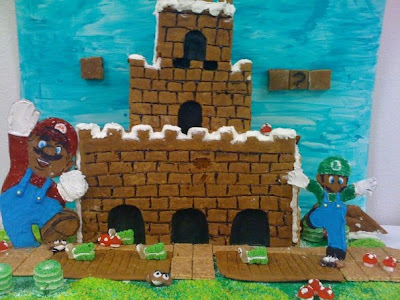 Also, Lauren, if you are reading this and are planning future pastry-based ventures into the land of retrogaming, Super Marzipan Bros. would make for a great post title. Would it have been better if Mario and Luigi were in white face? No, I guess not. That's another reason why marzipan might be good. It approaches their actual skin color. Doesn't it? I mean, what candy looks like Italian people? Mario and Luigi were originally dark-skinned Mediterranean types. Unfortunately, as with Jesus, Western artists took liberties with their appearance to make them more familiar and comforting to their audiences. Also, have you seen this Mario Kart wedding cake? I spotted the post the other day on a cake blog I had stumbled across and was perusing, and was just in awe. A google search turned up a few other cool ones, but none quite as epic.